BD has discontinued selling the BD Accuri™ C6 flow cytometer as of December 31, 2016. Service for BD Accuri C6 systems and their related options will continue until April 15, 2021. All current service contracts will be honored. Current extended warranties will not be affected and will be supported until they expire. One-year and multi-year extended warranty renewals will continue to be offered until April 15, 2020, provided these contracts end on or before April 15, 2021. After contracts terminate, BD will support the BD Accuri C6 system for as long as reasonably possible, depending on parts availability and other matters. If you have any questions regarding this matter, please see the following BD Accuri Frequently Asked Questions or contact BD Service Contracts Administration 1.877.232.8995, prompt 4. 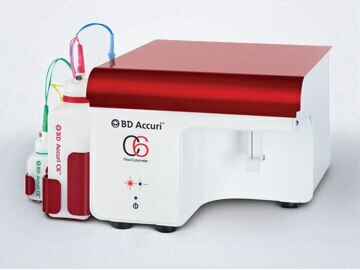 For information and special offers on the new BD Accuri C6 Plus personal flow cytometer, please visit our page www.bdbiosciences.com/us/instruments/research/cell-analyzers/bd-accuri/m/1294932/overview. Q: Will BD Biosciences continue to sell BD Accuri C6 spare parts and consumables? A: After April 15, 2021, our sale of BD Accuri C6 spare parts and consumables will be dictated by parts availability and other restrictions. Q: Will BD Biosciences continue to offer BD Accuri C6 operator training? A: BD Accuri C6 training and applications support at customer sites will be offered based on the availability of staff with product knowledge. Please contact your regional customer-training center for more information. In the US, contact: traininginfo@bd.com or call 1.877.232.8995, prompt 5. Q: How will we obtain service after April 15, 2021? A: After April 15, 2021, BD Accuri C6 instruments may obtain service from BD Biosciences depending on parts and personnel availability. Download the catalog of available kits and templates, or select from the following table. Once you have downloaded a template, select File > Open Workspace or Template and open it. Gate positions, zoom level, thresholds, and compensation, run, and fluidics settings are all fully adjustable and may require optimization for different sample types. Once the settings are optimized for your experiment, click Run to begin data acquisition. Note: The linked templates on this page are provided for the convenience of our research customers. Although they have not been validated, they have been used by BD or our customers to generate the sample data in the product information sheets and on the Sample Data tab. The templates have been designed using the current BD Accuri C6 software, version 264.21. They are not compatible with version 172.9, 227.4, or 202.8 software. Further optimization may be required before use, and it is the end user's responsibility to ensure that use of the template is appropriate to his or her research.